CERTIFIED KOSHER: Origin: China - Fujian Province. Dragon Phoenix Pearls gets its name from the appearance of the tea bushes "climbing" the hillsides like a Dragon coming out of the water. The tea is grown in an area near the border of the Fujian and Zhejiang provinces. The area is mountainous and is often shrouded in clouds or fog. The tea is picked in April/May and processed by hand by rolling each leaf and a bud into tiny pearl size balls. Once rolled, the tea is wrapped in silk mesh and dried by fire to set the form. 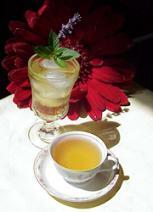 The tea is then held until August/September when the finest jasmine blossoms are in bloom. The jasmine flowers are picked before noon and set-aside until evening when the petals begin to open in the cool night air. Once open, the "marrying" of the jasmine to the tea happens in two applications after which the jasmine petals are removed. 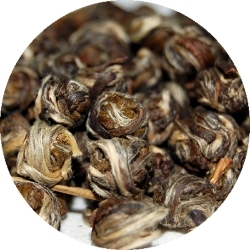 According to analysis done by Chinese researchers, Dragon Phoenix Pearl has a higher concentration of Vitamin C and Amino Acids than other teas. This is unquestionably one of the finest jasmines shipped from the port of Fuzhou.